7.56 points at 45 votes (rank 187). Rombachs C64-Spieleführer 8 September 1984 - "Voting 2"
Finding the way into the heart of the girlfriend with the following new start at a higher speed and extra life. FXXS: "Nice "roll & jump" for in between with a relatively easy entry difficult level. 7 points." Rombachs C64-Spieleführer: "Mentally retarded Neanderthals armed with clubs need to get outwitted and hits by stones were far from rare in these days. 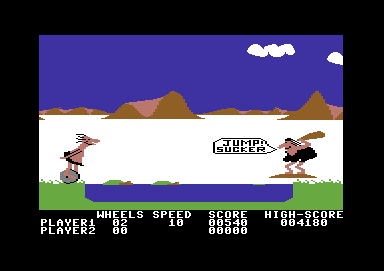 In short, the Stone Age biker has not an easy time and especially not the player. The characters are due to their funny animations suited to cause cheeriness. A versatile and difficult game, where success can only be seen after some practice and trying out. (Voting 2)." Shakermaker303: "Alas, this was always nice. I liked the guy, who bravely rushed towards the cry for help, no matter what oh so great dangers were approaching him. The sound was cute, I so much liked the sound while hopping or ducking in combination with the rolling stone. A game that really everybody can play, funny graphics and cute game ideas. Even my old dad liked it, although he basically despised computer games. The ending sequence wiht the woman was also cute, where the heart came flying to him :-). For me personally the full 10 points." Klaws: "One of the games, that keep stuck in your memory. Of course mainly because of the amusing character, but also because playing it was simply fun. Even after a few years you galdy search out the game again. Graphics and sound probably won't win a prize, but they fit the game. I give 9 out of 10 points." 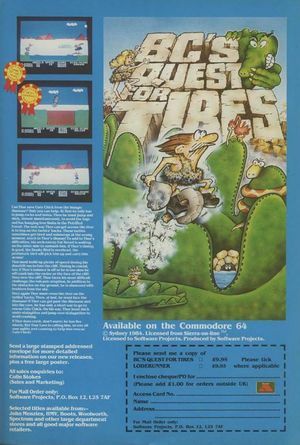 Blubarju: "This one and Kaiser were the first games that I have played on a C64. 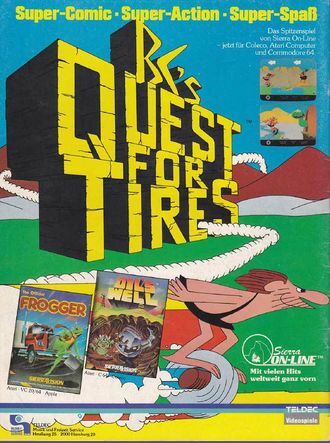 At that time it was at a friend's, who curiously always named this game Oerm. Well, probably due to the funny soundFXs while jumping. Overall well-done! 8 points." 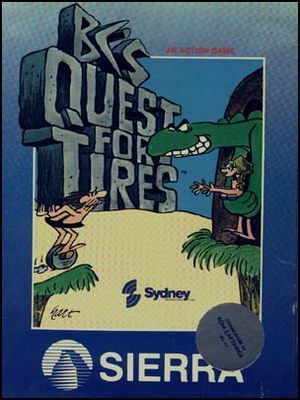 BC's Quest for Tires is based on the comic strip B.C. by Johnny Hart, which appears on a daily basis in US newspapers since 1985.